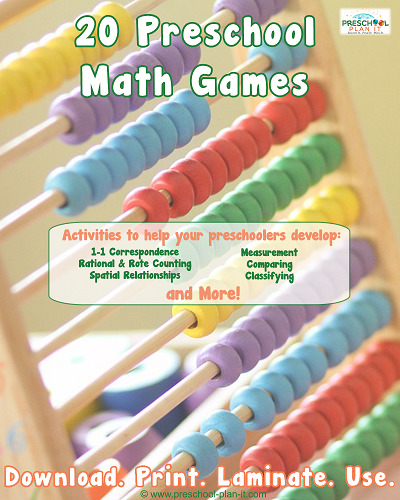 The Creative Curriculum is based on well known theories of child development. It also meets all of the criteria for a developmentally appropriate early childhood curriculum. 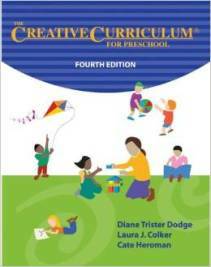 The Creative Curriculum was written by Diane Trister Dodge, Laura J. Colker and Cate Heroman. This curriculum is based on the premise that the best way to teach young children is by using an appropriate environment as well as a planned appropriate schedule and good teacher/child interactions. The weekly planning form for the Creative Curriculum is awesome. I have seen people use this form even when they are using another curriculum. The planning form is two pages. The first page includes the date, the name of the teacher and co-teacher and the specific topic to be covered that week. This page of the form also includes a place for a "To Do" List and a place for Family and Community Involvement. The rest of the first page of the planning form is divided into spaces for changes to the environment. What I like about this first page is that it causes a teacher to really think about the individual needs of her students as she makes regular adjustments to each of the centers in her classroom. The second page of the Creative Curriculum planning form is for planning groups. It lists types of group activities down the side. The types of groups listed are Group Time, Small-Group Activities, Story Time, and Special Activities (like field trips and other special events). Group Time is for large group activities like songs, stories, games and discussions. The top of the second page of the Creative Curriculum planning form is divided by days of the week (M-F). This second page of the planning form looks more like a lesson plan form you might see in any classroom. At the bottom of this page is a place for the teacher to write notes for her own benefit (reminders, changes, children to observe etc.). On this page you would write the actual activities you have planned for these group times for each day of the week. What song will you sing? What CD is the song on? What literacy activity will you do? What activity will you do during small groups to address development of various skills? If you were planning to use stores as a topic you might include blocks labeled with store names cut from advertisements and delivery trucks in the block area. You might include a cash register, toy money, advertisements from stores, pencils and paper for shopping lists and products to be sold in the dramatic play area. In the art area you might include advertisements from stores for collages, cash register tape and materials for making store signs. In the library area you might include stories about shopping. In the discovery area you may or may not incorporate the topic of study. My only objection to themes in general is that people often come up with some contrived activity to meet the theme that has no learning value. (My opinion only) You could however do a pet store or some such thing in the discovery area. At the sand and water table you could let the children set up a bakery with signs etc., Music and movement could be a dance studio, TV studio or music store. But at the same time you are thinking about your topic of study, be sure to think of the skills you want each child to learn. Maybe you want to include pennies for counting instead of paper money with large numbers with the cash register. Or you may want to use paper money in small denominations for those children who are ready to read numbers. Teachers would probably want to include activities that reflect the topic. I would caution teachers to always keep in mind the needs and interest of the children as well as the topic, just as you would when you make changes to your centers. Then decide, "Is this activity contrived for purposes of this weeks topic or does it make sense in relationship to the skills we are trying to teach?" The teacher's manual for the Creative Curriculum tells about the theories the curriculum is based on. It tells what types of things to think about as you individualize your program. The teacher's manual also includes the "Developmental Continuum" for children from three to five years old. Teachers write anecdotal notes on all children in their classroom. They can see where their children are developmentally by looking at the continuum. Teacher's will be able to easily see what developmental milestone should come next and they will be able to plan activities and changes to the environment that will help each child move to the next level of development. The teaching manual for the Creative Curriculum tells teachers precisely how to set up their centers for optimal learning. It also tells how certain problem behaviors may be changed by specific changes to the environment. The manual gives suggestions about how teachers can schedule the daily routine. 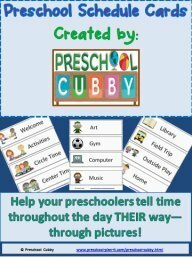 I have created a set of Preschool Schedule Cards that would fit perfectly with this curriculum! Click Here to read more about them! Even though the lesson plans are written for the week it is suggested that teachers meet daily to go over anecdotal notes (child observations) and make adjustments to the plan. Additional information is provided in the Creative Curriculum teacher's manual about addressing literacy, math, science, social studies, the arts, technology, etc. within the context of the environment and schedule. There are also sections on setting up each center to facilitate optimal learning. Additional chapters of the manual cover assessment and family roles.